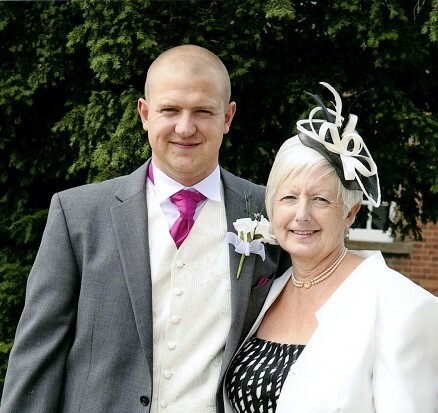 I was diagnosed with bowel cancer at 55 years old, but it wasn’t until my son was diagnosed with the disease at a young age that we realised we had such a strong family history. I now know that twelve people over five generations of my family have been devastated by bowel cancer because of Lynch syndrome. Lynch syndrome, is an inherited condition that puts you at an increased risk of developing bowel cancer. Unfortunately, there is a 50:50 chance that children of a gene carrier will also inherit the condition, meaning whole families can be devastated by cancer. To put this into perspective, my dad died from bowel cancer in his early 40s, his parents died from the disease and so did my great grandparents. My dad’s sister also has Lynch syndrome and my other two adult children are also gene carriers. This is so any potential family members can be known too. I’m one of the lucky few identified with the condition. Unfortunately, there are still so many left who don’t know, as testing for Lynch syndrome doesn’t always take place. I was only tested for Lynch syndrome following my son’s cancer diagnosis. It’s so important that this testing takes place – in fact anyone diagnosed with bowel cancer today should be tested for Lynch syndrome. Knowing you have the condition means you can take steps to reduce your risk of getting cancer. This is especially important because unfortunately there is no cure for Lynch syndrome. So now my family and I know we’re able to take action to monitor our risk by taking preventative measures such as having our regular colonoscopy appointments. Having Lynch syndrome is stressful enough; we don’t need the extra hassle of chasing appointments too. Because of the higher cancer risk people with Lynch syndrome, like me and my family, are advised to have regular colonoscopy appointments to monitor cancer risk and detect cancer before it develops. These appointments are advised every 18 months to 2 years. Mine are generally on time – every two years, but other people aren’t so lucky. Like testing for the condition, the quality of management varies across the country and unfortunately many people, including my children, are left facing extreme delays for their vital routine appointments. My children for the past six years have had to chase and chase their local hospital for an appointment. My middle son, who is due an appointment this month after a two year gap, was recently sent a letter saying it will now be in August 2018 – this will now make it nearly three years since his last test. It’s not acceptable. I ended up having to phone the nurse practitioner who thankfully remembers our family as she performs my colonoscopies and so she managed to bring the appointment forward. But it shouldn’t be like this. I would love to say this is a one-time occurrence but it’s not. My youngest son, who was diagnosed with bowel cancer in 2011, should have yearly appointments but he too often has to either ring his consultant or nurse practitioner to chase for his appointment. If he’s lucky enough to speak to the endoscopy reception directly, he’s just told there are no special cases and he can't jump the queue. We’ve had to complain to the Chief Executive, who has assured us that there will be a new computer system in place to tackle delays facing people with genetic conditions, but it’s not about trying to jump the queue, it’s about making sure that we get the best care available, on time, in order to monitor our risk and potentially save our lives. My eldest daughter, 40, now goes private for her colonoscopy as its quicker, less hassle and she gets the same endoscopist performing it. Having Lynch syndrome is stressful enough; we don’t need the extra hassle of chasing appointments too. There are so many people across the country facing long delays for their appointments too, just like my family and I. The service as it stands is unacceptable. Everyone with Lynch syndrome should receive the same standard of colonoscopy and care, regardless of where they live. It shouldn’t come down to potluck. That’s why I’m supporting Bowel Cancer UK’s campaign for the Bowel Cancer Screening Programme to be responsible for providing colonoscopy screening for people with Lynch syndrome. At the moment only healthy people aged 60+ are screened for early signs of bowel cancer through this national Programme and because there are waiting time targets in place people receive their appointmentson time, regardless of where they live. This should be the case for people with Lynch syndrome too. It’s time to close the screening gap. To show your support for families, like Lynne’s Sign the petition and call for the urgent improvements to be made to the management of people with Lynch syndrome. Find out more about why Bowel Cancer UK are calling for the Bowel Cancer Screening Programme to screen people with Lynch syndrome. Share your story. Personal stories help Bowel Cancer UK highlight the experience of people affected by Lynch syndrome, raise awareness of the condition and can encourage and inspire other people affected to come forward. The stories can be used in the media, on their website, on their social media and in their materials.